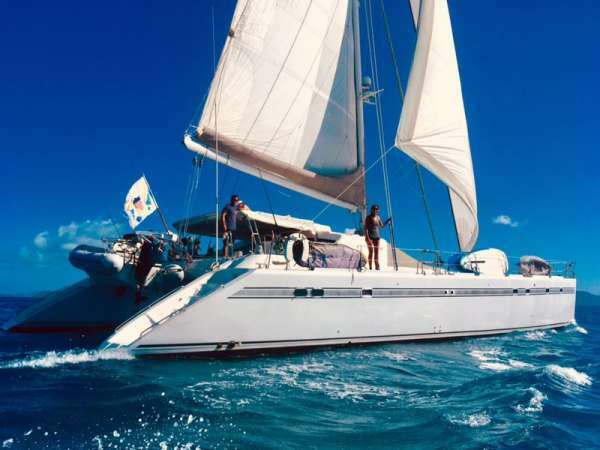 Catamaran Kelea is a 1996, 65' Privilege catamaran offering crewed yacht charters in the BVI & USVI. 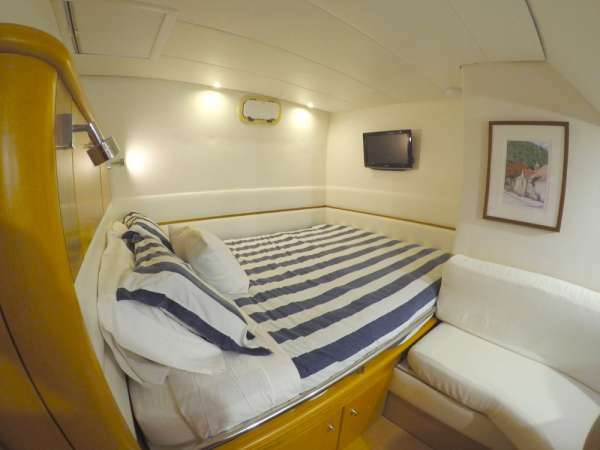 She features a recent refit, on-board diving for certified guests, and accommodations for up to 10 guests in 1 King Master Suite plus 4 Queen cabins. 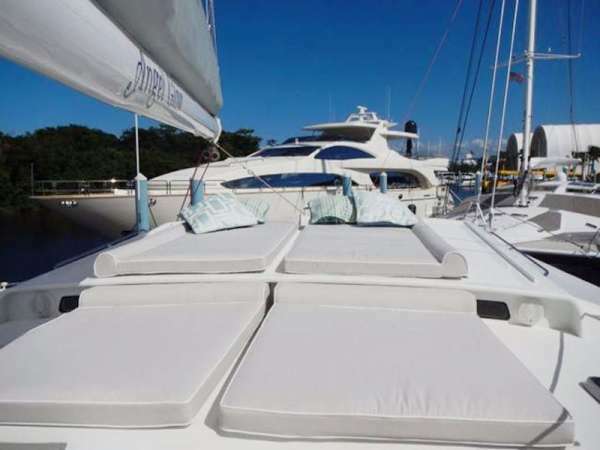 Catamaran Kelea is a Carefree Yacht Charters mid-range, luxury choice for families, couples, divers or special occasions. Here's what Dan & Alli told Carefree Yacht Charters about their service style: "Our style is simple: we want guests to feel at home. It is our goal to establish communication far in advance so that when guests arrive, they already feel like friends. We want to be able to share the new memories they are creating, as well as maintaining a professional and courteous service." 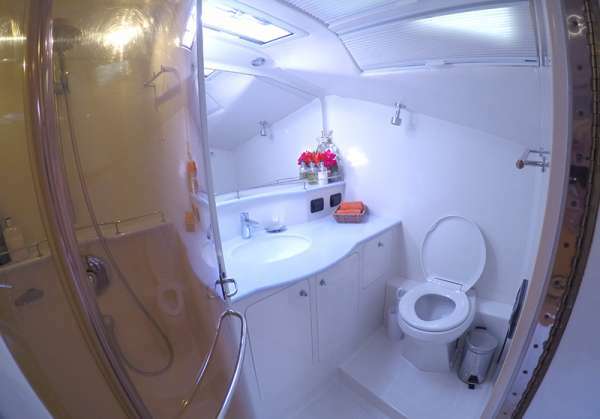 Rates from $24,500 to $28,500. View availability and rate details. To learn more about this crew or for further details about KELEA, call us in our South Florida office at (954) 980-9281, toll free at (888) 670-6884 or fill out our Quick Request Form. 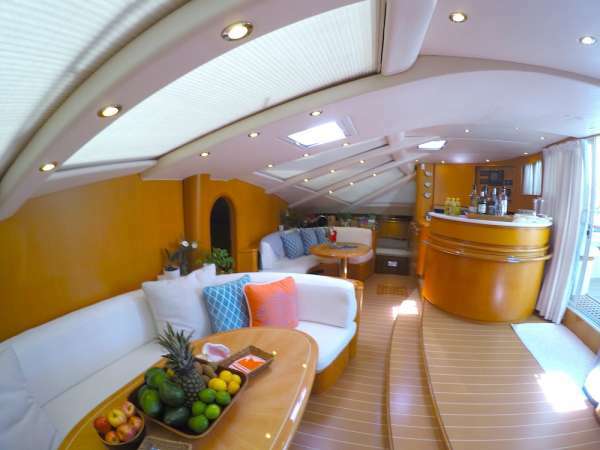 Christmas Week For 7 nights aboard: 8 guests: US$30,250 10 guests: US$31,350 New Years Week For 7 nights aboard: 8 guests: US$31,500 10 guests: US$32,800 For Winter Season 2019/2020 and on ward: Rates are for 1 King berth suite, 3 Queen berth suites and an upper & lower single berths suite (best for young adults or kids). 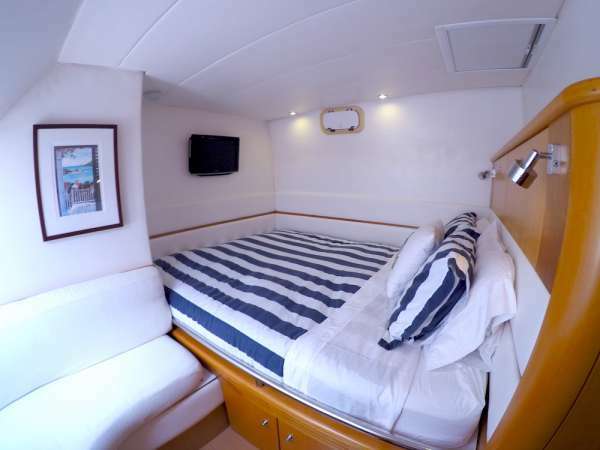 For the 1 King berth suite and 4 Queen berth suites layout, please add on $2000/week. 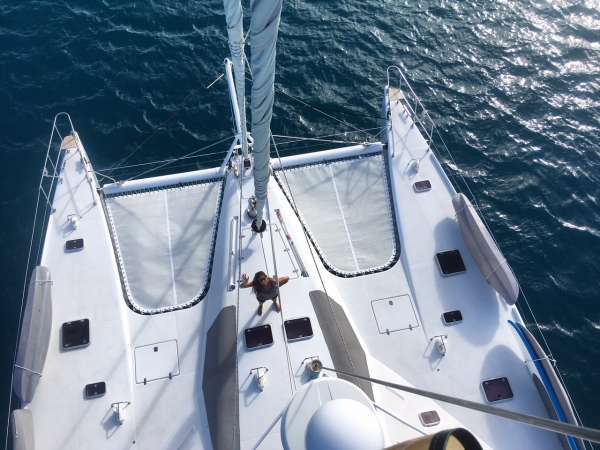 Charters outside the Virgins: Regardless of whether or not a vessel may or may not include taxes in the vessel's listed charter fees for Virgin Islands charters, in general, no fees, port dues, nor taxes are included in the charter fee for any charter outside the Virgin Islands unless otherwise agreed. Captain Dan’s passion for the water started at an early age along the coast of Delaware. He developed his skills after moving to Wrightsville Beach, North Carolina, where he learned to read the wind and the water for both surfing and sailing. He obtained his Captain’s license in North Carolina, and quickly began guiding on the water and sharing his love of nature and the sea. Dan worked on Bald Head Island, North Carolina helping in the development of an outdoor adventure company. 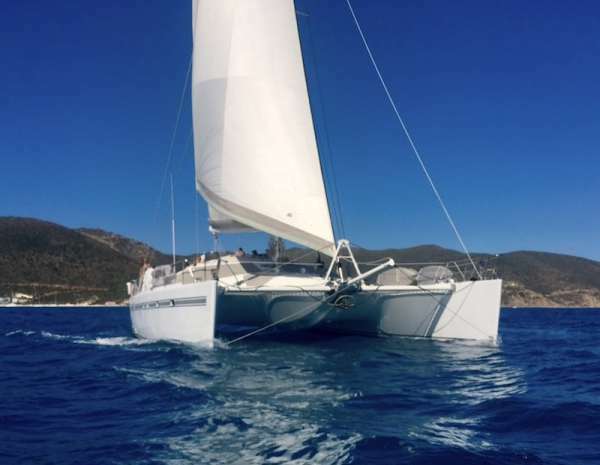 He obtained his US Sailing Association Certification and American Sailing Association Certification, and began instructing others on sailing. During which and since, he has owned several personal sailboats and captained others, allowing him to learn and hone in his skill as a Captain. Alli was born on the East Coast where as a young girl she grew up with a passion for the ocean and adventure passed to her by her father. In High School, Alli participated in multiple Outward Bound wilderness classes, and from there the adventure never stopped. She attended the University of North Carolina Wilmington, during which time she began working for the same sailing and kayaking company where she met her future husband, Dan. Alli has grown up with a passion for cooking food, that not only tastes good and looks good, but that is good for you. She began cooking at a young age, preparing meals for her family of five, and continues to create beautiful dishes with love and artistry. She was, also, awarded First Place in the 2016 VICL Culinary Competition. Dan and Alli met in the Summer of 2009 on Bald Head Island, North Carolina, where they worked running kayak trips and sailing excursions. Together they managed the company, never losing sight of their passion for travel. From the North Shore of Hawaii, to the coastlines of Costa Rica, the couple began their adventures together starting that summer. 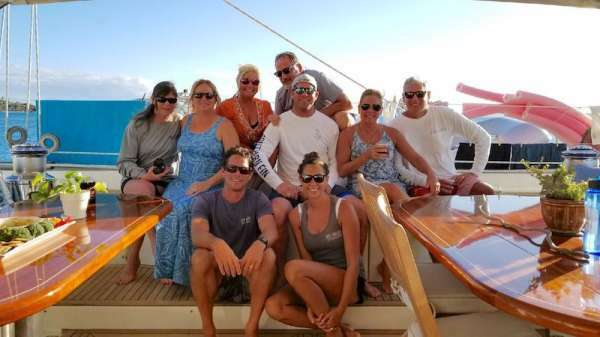 After sailing their personal sailboat, Goose , over 2,500 miles from North Carolina to the Bahamas and back they discovered their love for the islands. 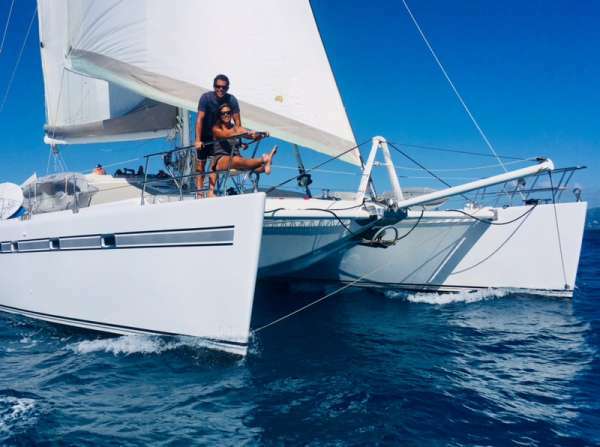 They moved to the Virgin Islands to pursue their love for the sea and sailing, where they began working for a popular watersports company. 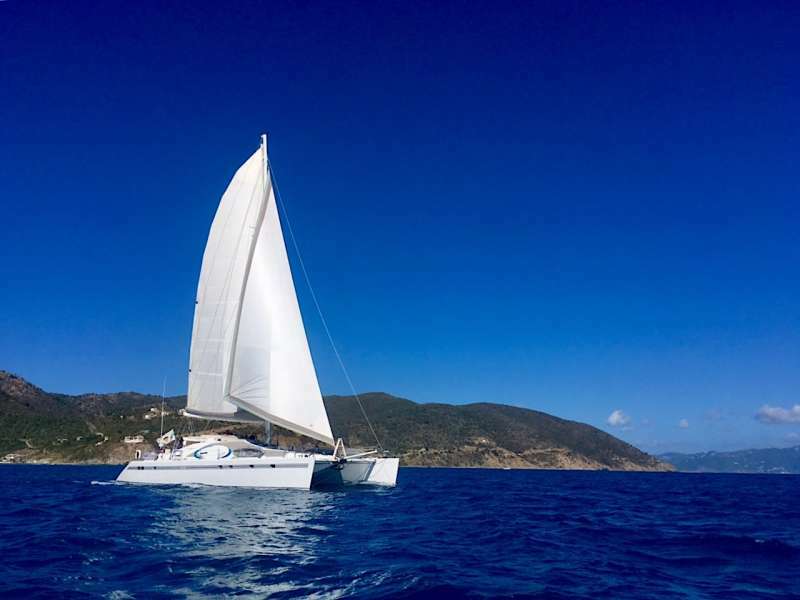 Dan captained a 50ft catamaran, running day charters around the BVI and USVI, and Alli managed the hotel’s land and sea based watersports activities, meanwhile obtaining her certifications to crew. 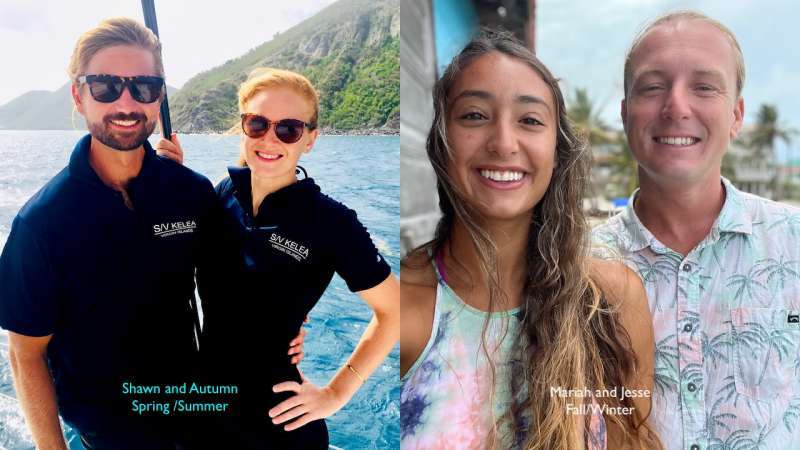 After living together in the Virgin Islands for three years, the couple married in the summer of 2016 and they have been a Captain and Crew team ever since. 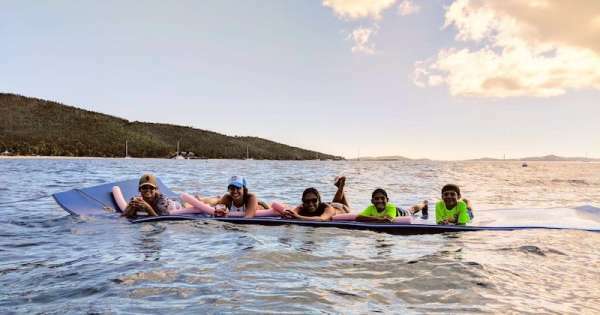 They continue to get out on the water to snorkel, surf, sail and fish whenever the opportunity allows. Whether searching for lobsters, searching for waves, or simply sailing, they always enjoy their time spent on the water. 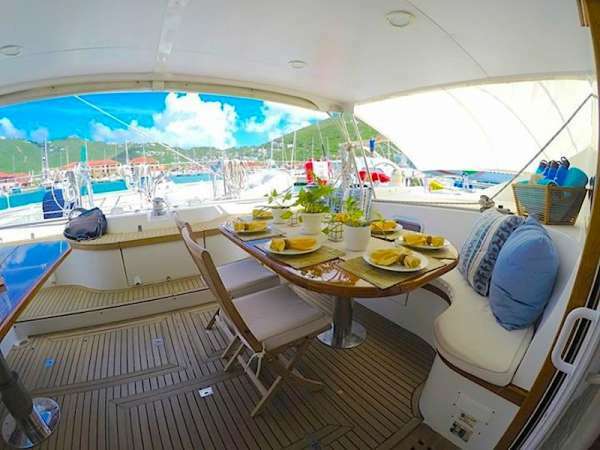 One of their favorite quotes is, “The Virgin Islands were meant to be viewed from the water.” s/v Kelea allows them to share their love for the islands, the sea, and all the two have to offer, with all of her guests. 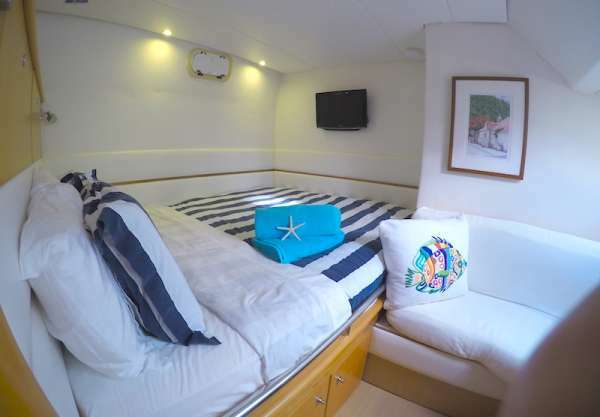 From 2019/2020 Season: Kelea accommodates up to ten guests in 5 guests cabins, all ensuite: one centerline master king suite forward, and three queen-berth guest suites, as well as a starboard forward upper &amp; lower twin berth suite. 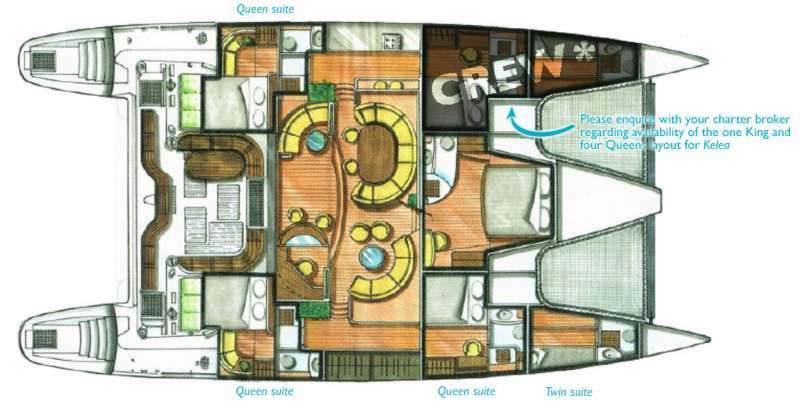 Please enquire with your charter broker regarding availability of the one King and 4 Queens layout. 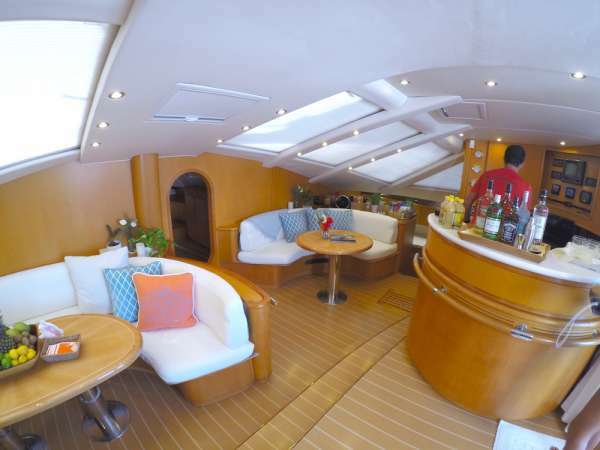 Kelea is fully air-rconditioned throughout and makes her own purified water onboard. Costs: Up to 5 dives during the week and gear are included for certified divers. We had a fabulous trip. Everyone had a blast. There were activities and individual facets of the trip that appealed to everyone's tastes and accommodated everyone's needs. Passengers from 10 to 50 years old were happy and satisfied. There was more than enough room for the 9 of us. 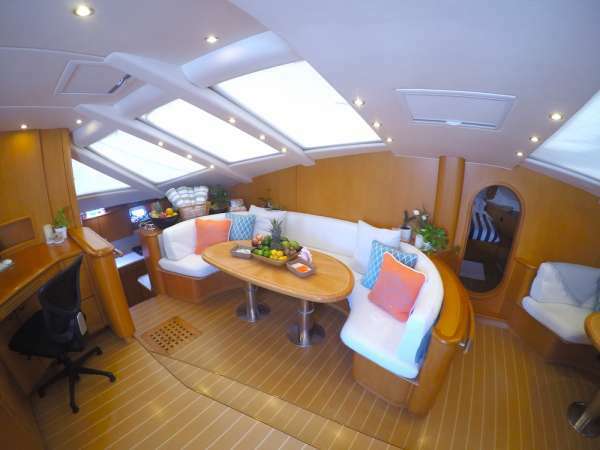 We were surprised and appreciated the inside and aft spacious living areas. Dan and Alli were great. And the food was outstanding! Alli continuously amazed us. True gourmet - and I consider myself a bit of a foodie and a tough critic. The crowning jewel was a full Thanksgiving spread. Dan took us all tubing, water skiing and wake boarding multiple times. Jagger and I also did multiple scuba dives with Dan. They were great hosts, easy to get along with, involved but not intrusive. Thank you for all your assistance and for the CYBA gift card (we put it to good use). Good morning, Lynne. Please add me to your e-newsletter. I look forward to reading them. Believe me....another charter is in our future....someday. I have to tell you what an amazing vacation our trip was. It was more than I could ever imagine. 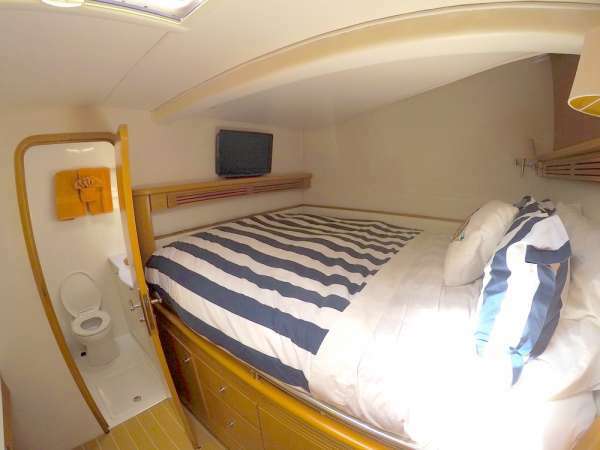 From the spacious, clean and quite enjoyable yachts, to our amazing crews, the only word that describes the trip is "PERFECT". Alli and Dan were so enjoyable...Dan explained all the history/islands we visited and Alli's food presentations were nothing short of 5* quality. Our crews worked so well together being a tandem sail, and went the extra mile to ensure everyone was comfortable and content. I especially appreciate their help in picking up the Yeti cups and having them ready for our arrival, and scheduling our first night dinner at the marina. I cannot to you how much I appreciate all you did to ensure every point was covered prior to our trip. You couldn't have picked more fitting crews for our group. We are all still talking about the trip, and several of us have already spoke with friends that will be contacting you in the future. Again, thank you so much for all you did for our best vacation yet! Lynne, Our stay on Kelea was superb! Alli and Dan were gracious, patient, knowledgeable in both the boat and area, provided excellent service and, overall, very professional while still being humble! The meals were beyond expectations! Overall a five star trip with 5 being the highest rating - highly recommend! Good morning Lynne, I would have to say the sailing trip on Kelea was the best vacation we've ever had. Bill and I truly enjoyed everything about the trip. The food was delicious and so well presented, it was like being in a fine dining restaurant every day! Alli took great care of us and made us feel at home. Dan was awesome and took time to explain the workings of the yacht and where we were going each day. It was a very relaxing and enjoyable trip and I would highly recommend it. We hope to do it again sometime! I know I sent a few lines with the photos but....Alli, Dan and the kelea were all phenomenal. Best family vacation. The boat was beautiful and the perfect size for our 2 families. Alli and Dan keep it in immaculate condition. I'm amazed. Alli's ability to whip anything out of the galley kitchen is crazy. This was probably the best 3 meals a day for 7 days in a row that I have ever had. 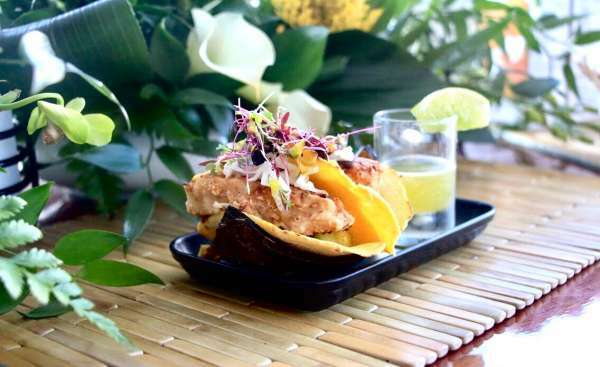 Just when you think it can't get more flavorful or complex she whips out a new incredible dish. 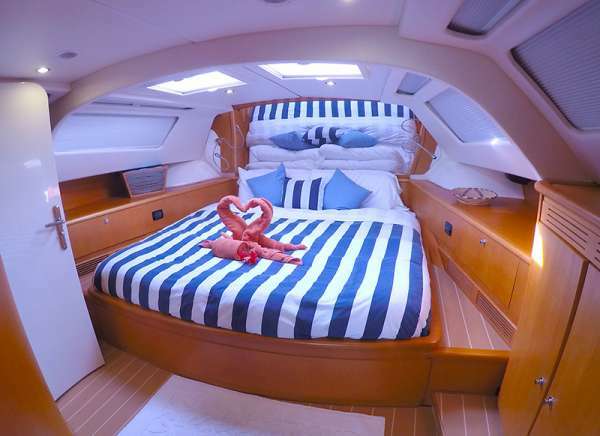 We called her the Ina Garten of the yachting world. Plus she has to be the sweetest thing on earth. Nothing was ever to much to ask of Dan. More wake-boarding, snorkeling, hiking, diving, fishing. We did it all. Multiple times. We felt safe, secure and well taken care of. Most importantly, I need to thank you. I feel like you helped me pick this magical combination of exactly what we needed and wanted just by asking me a few questions. I said multiple times during our trip how you nailed it. I have already given your name to one of my patients who asked and that was before we even left. Your promptness and attention to detail were noticed. And by the way Alli and Dan have incredible things to say about you as well.